Creative concept by Tess Guinery, miss creative genius and my inspirer for everything I want to be when grown up. 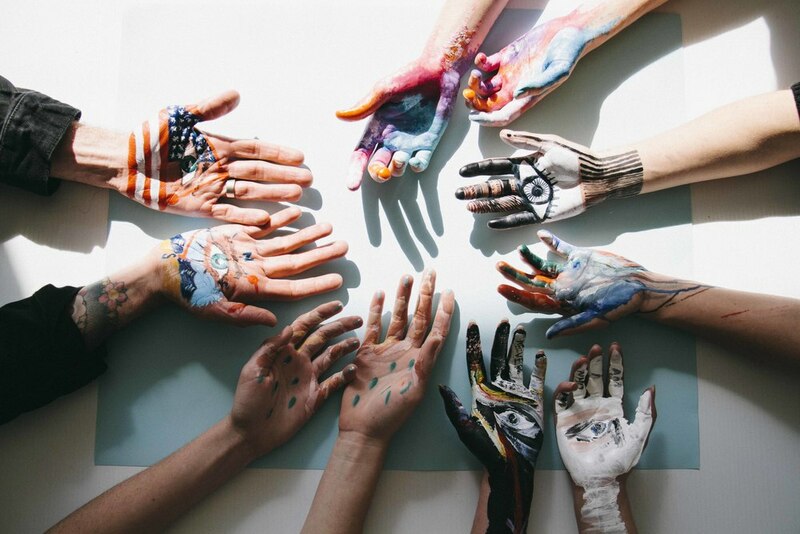 5 artists + 5 hand-models, music, coffee and lots of paint! My idea of a perfect day! Each artist had 20 mins to meet their hand model and learn all they could about each individual’s journey. From this conversation alone, art was painted by the artists onto the hands of the subjects as an interpretation of their story, their personality. Whether minimal, abstract, detailed - it was entirely the artist's initiative and the results were so wonderfully different! "WHEN INTRICATE AND ABSTRACT COLLIDE"
"DON'T THINK JUST DO - IT'S ALL GOOD JUST GO WITH THE FLOW"
"In my painting I tried to capture the idea of an adventurer on a journey. There are many individual destinations on the way, which each play a part in forming Mike’s identity up to this point. And while the future is still open and unknown, the spirit of adventure loves this challenge." Tess is a a girl with a bright past and a bright future, who has sought an experience-filled life. Her left hand represents her 5 strong influences which then culminate at the eye to form her ‘world view’. I sensed a focussing and a sharpening occurring in her life, so the arrow coming from the eye depicts this/ Her right hand is about clearing the influences and chatter, and looking at who we really are. It’s about the battle betweenknowing who we are, and asking the question: who am I? To see the full story and behind the scene shots, visit Tess Guinery's blog.